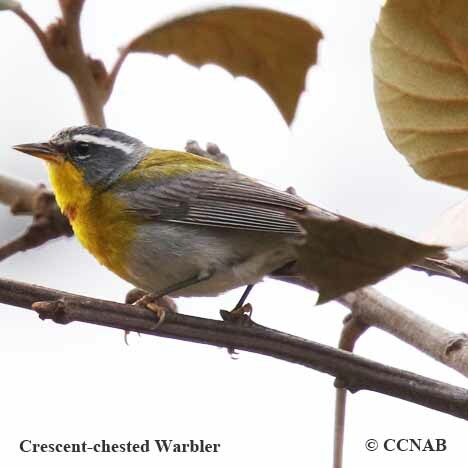 Species: The Crescent-chested Warbler (Dendroica castanea) can be found in the mountains of Mexico and Central America. 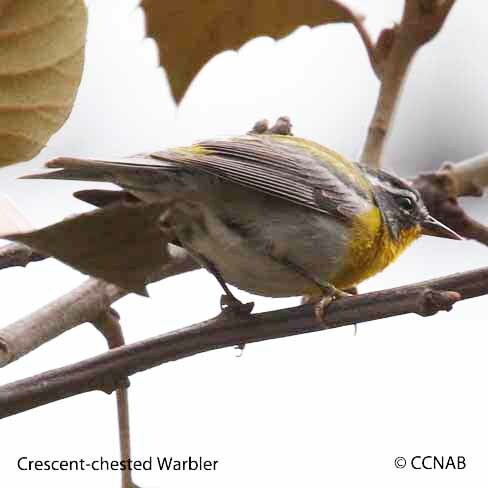 Has some colour similarities to the Northern Parula and the Tropical Parula. Seen mostly on the slopes of the mountains, it prefers a deciduous forest. 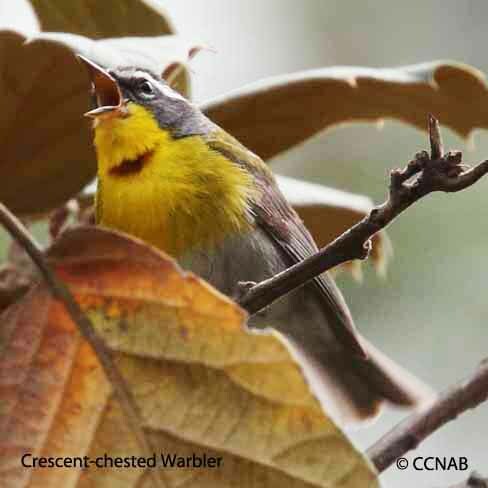 Population appears to be stable, associated with other passerines in flocks during the winters months to forged for foods, not endangered. Distinctions: Both male and the female have bold white superciliums. The male has a gray crown, nape and tail, grayish black wings with no wing bars. Olive green back, bright yellow throat, breast and flanks, white lower body and under tail coverts. cresent at base of eye, bottom side of lower mandible is yellow. Female and juvenile have the same appearance, but in duller colours. Voice: Chipping call, buzzy notes, repeated over. Nesting: Three to five white coloured eggs. Builds nest in trees. The nest is composed of leaves, twigs, mosses, and lined with fine grasses and hair. 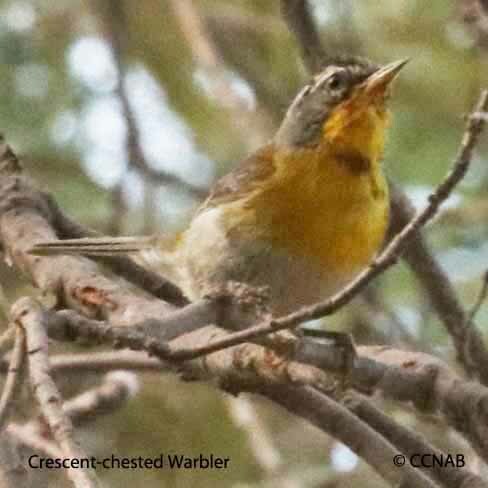 Distribution: Found along the eastern and western mountain slopes in northern Mexico, into Central America, range map indicates this warbler keeps the same territory 12 months of the year. Is not reported in the Yucatan Peninsula regions. 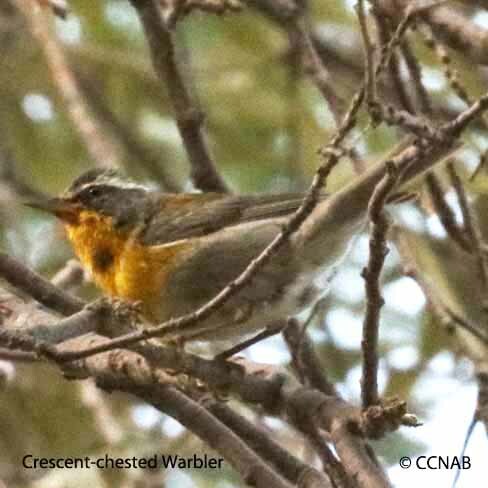 Has been identified in Arizona on just a few occasions, and recognized as a vagrant and a rare visitor. Has been reported in Texas, north of the Rio Grand River, but not confirmed.